Orange Class have returned to Turney School for the new autumn term with plenty of enthusiasm for continued learning. Plus we also want to have some fun in our lessons! We have spent the early part of the new term by recapping on some of the existing knowledge that we have. This will allow the teaching staff to understand where resources need to be placed to continue with our learning across the curriculum. Our early maths weeks has been set up to help the Orange Class children reinforce their understanding of the number line. Different table activities were set up, depending on each individual learning need. Most pupils are confident when counting from 1-20 in sequence. Other pupils have been practicing matching up a number character with a physical number of shapes. 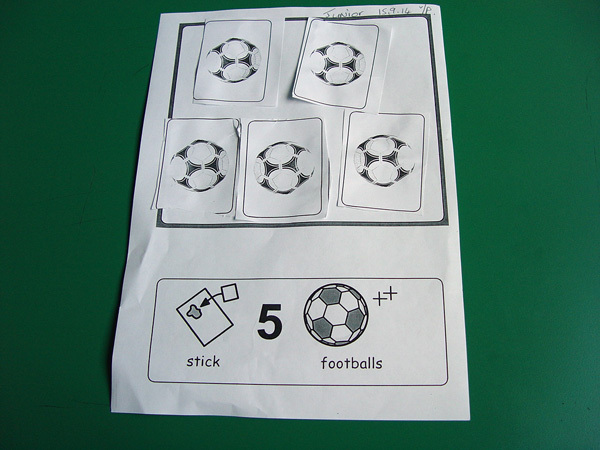 An example is cutting and sticking five football pictures on a sheet of paper with a 5 as the main headline. You can see these counting skills in action in the video above.